The chart was first published in a magazine in 1842 as a typed (see below) “table copied from his own manuscript, in possession of a gentleman in Washington” and later a handwritten form appeared in an 1858 book. Artichokes, Asparagus, Beans, Beets, Broccoli, Cabbage, Carrots, Cauliflowers, Celery, Corn, Corn Sallad (Valeriana Locusta, grows among corn), Cresses, Cucumbers, Currants, Eggplants, Endive, Grapes, Snaps, Lettuce, Lima Beans, Melons, Mushrooms, Parsley, Parsnips – Windsor, Peas, Potatoes – Irish (white), Radishes, Raspberries, Sorrell, Spinach, Sprouts, Squashes, Tomatoes, Turnips, Salsafia (Salsify), Watermelons. "It is well known that President Jefferson, while engaged in transacting the great affairs of the nation, found time also to gratify his taste for philosophical inquiries into the most minute matters. As one proof of this, we publish below a table, copied from his own manuscript, in possession of a gentleman in Washington. It is a Register of the Vegetable Market of that city for eight years, viz. 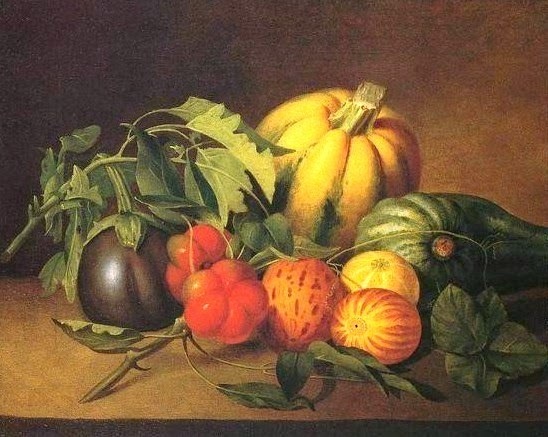 from 1801 to 1809 – showing the date of the appearance and continuance in market, of the different kinds of Vegetables, and is, probably, a summary of similar tables kept each year." "This is a table beautifully drawn up, giving the average earliest and latest appearance of thirty-seven varieties of vegetables in the Washington market during the whole eight years of his presidency! To think of a leader of a great civil revolution—the founder of a new party and creed—the statesman engaged in the pressing cares of a nation—watching with a green-grocer's assiduity, and recording with more than a green-grocer's precision, the first and last appearance of radishes, squashes, cabbages, and cauliflowers in the market—suggests a curious train of reflections!" Painting by James Peale (1749-1831) - brother, not one of the many sons, of the famous artist Charles Willson Peale. Both were born in Maryland and lived in Philadelphia.